In 2017, work-related deaths hit an 11-year high in Massachusetts, and the industry with the highest number of fatalities was the construction industry—74 workers died and 21 of them were in the construction industry. An additional 79,800 people were injured and many of them work in the construction industry. We all rely on construction workers to build our homes, our businesses, our stores, our community buildings, and our infrastructure. Construction workers do important, but dangerous, work. 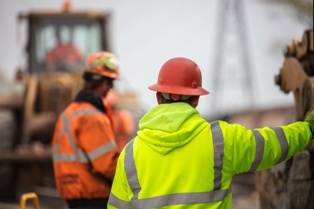 Accordingly, it is important for construction workers and their loved ones to understand the types of accidents that could happen on a construction site, the type of injuries that could result, and how workers’ comp can help if you’re hurt. Crushed by accidents. Getting caught in or between pieces of equipment is a serious risk for construction workers. Falls from heights. Many construction workers work on scaffolding and ladders. Falls from heights are a leading cause of injury and death in the construction industry. Slip and fall accidents. Trip or slip and fall incidents can also result in injuries when they are on flat ground. Machinery accidents. Large machines such as cranes and forklifts can result in significant injuries when an accident occurs. Tool accidents. Smaller tools such as nail guns, hammers, and saws can also result in painful injuries that require medical care and time away from work. Motor vehicle accidents. Trucks and other vehicles may be necessary on construction sites. A crash between vehicles, an accident when a truck runs over a pedestrian, or an accident when a truck hits a piece of equipment can be catastrophic. Exposure to hazardous materials. Some dangerous materials such as solvents, chemicals, and building materials can lead to respiratory illnesses or burn injuries. Electrical accidents. Electrical accidents are a leading cause of construction worker injury and death. An electrocution, for example, can result in a burn injury or fatality. Cave-in accidents. This is a significant risk for trench workers. When the walls of the trench collapse then a worker may be deprived of oxygen or suffer another injury. Weather-related accidents. Extreme temperatures can result in a person’s body temperature becoming dangerously high or low, high winds can result in flying debris, rain can result in slippery conditions, and lightning can cause electrocutions. These incidents can happen because of negligence, because of faulty equipment, because of an employer’s failure to comply with safety regulations or even truly by accident. Spinal cord injuries. You may suffer from partial or complete paralysis, and you may suffer from some loss of sensation if you have a spinal cord injury. Traumatic brain injuries. A brain injury can impact your cognitive ability, your emotions, your senses, and other important functions. Broken bones. Whether you break an arm, leg, hand, foot, facial bone, pelvis, hip, or another bone, you will require medical care, you may need time off from work to heal, and you may suffer long-term disabilities. Burn injuries. An electrical injury or a piece of hot equipment can result in a serious and painful burn injury. Eye injuries. Chemicals or debris that ends up in your eye can result in a painful eye injury or a lasting eye injury that impacts your ability to see. Internal injuries. Some accidents, such as falls from heights, crushed by accidents, or motor vehicle crashes can result in injuries to internal organs. Sprains and strains. Overuse of muscles, repetitive motions, or falls can result in sprains or strains that keep you out of work. Death. In the most serious cases, death can occur. It is important to see a doctor as soon as possible after a construction-related injury for a prompt diagnosis and treatment plan. If you have been injured on a Massachusetts construction project, or your loved one has been killed, then you may be able to receive workers’ compensation benefits. These benefits may include compensation for your medical expenses, lost income, vocational rehabilitation, and more. Please contact our experienced workers’ compensation lawyers today for a free, no-obligation consultation about your rights and potential benefits.